Mars Mystery: Does Flowing Water Cause Red Planet's Dark Streaks? Features called recurrent slope lineae (RSL) have been spotted on some Martian slopes in warmer months. Some scientists think RSL could be seasonal flows of salty water. Red arrows point out one 0.75-mile-long (2 kilometers) RSL in this image taken by NASA’s Mars Reconnaissance Orbiter. THE WOODLANDS, Texas — Mars' mysterious dark streaks continue to intrigue and puzzle scientists. Over the past several years, Mars-orbiting spacecraft have spotted dark, fingerlike features that scientists call "recurring slope lineae," or RSL for short. These are dark flows, possibly caused by liquid water, found at many locations throughout low and middle latitudes on Mars. More than 120 candidate and confirmed RSL sites have been discovered, with some sites containing 1,000 or more individual RSL. Slope streaks in Acheron Fossae on Mars. What creates these dark streaks is a puzzle, but one hypothesis is that they are caused by fine-grained sand sliding down the banks of troughs and craters. But the mechanism of slope streak formation remains up for grabs. Some researchers, for example, invoke a "wet" mode for the features' origin: a percolation of brine (salty water) in the shallow subsurface on Mars. These active and baffling features garnered their own dedicated session March 18, held here during the 46th Lunar and Planetary Science Conference. Leading experts gathered to discuss enigmatic RSL and slope streaks — what causes them and what they may be telling researchers about present-day Mars. "Some role for water appears required to explain the RSL, but the origin of that water remains puzzling," said Alfred McEwen, principal investigator for the superpowerful High Resolution Imaging Science Experiment (HiRISE) camera on board NASA’s Mars Reconnaissance Orbiter, which is now circling the Red Planet. Slope streaks on dusty slopes, McEwen said, "are much easier to understand, as all observations are consistent with relatively high-velocity dust avalanches." McEwen contributed to research that indicates RSL grow slowly and incrementally, form on warm slopes in warm seasons and annually fade and reoccur. Different from slope streaks, RSL continue to develop over time scales of weeks and come back in multiple years at the same location. RSL locations occur on steep crater walls, and typically have only a small number of lineae — often fewer than 10. These properties strongly suggest that RSL formation is controlled by a volatile substance, and liquid water is a likely candidate, reported Colin Dundas, a planetary scientist at the U.S. Geological Survey’s Astrogeology Science Center at Flagstaff, Arizona, along with McEwen and Sarah Sutton, who is also based at the University of Arizona. However, the source of water is unknown and dry processes cannot be entirely ruled out, they noted. "A major advance in understanding [these features] may require new flight experiments — orbital or surface — that are designed to study RSL and to better understand the present-day water cycle on Mars," McEwen told Space.com. Searches to find new RSL locations are ongoing. "In the near term, we need to extend our high-resolution monitoring of RSL both in space and time, in order to understand the range of places where they exist and how they vary from year to year," Dundas told Space.com. "In combination with the results of modeling and lab work, this can help us understand the local conditions that allow them to form." The High Resolution Imaging Science Experiment (HiRISE) is one of six science instruments aboard NASA’s Mars Reconnaissance Orbiter. HiRISE, which is built by Ball Aerospace, is providing unprecedented views of layered materials, gullies, channels and other Martian features. RSL could pose planetary protection concerns, Dundas and McEwen said, so high-resolution monitoring across multiple seasons is needed when steep slopes occur near candidate landing sites. In other work, David Stillman of the Southwest Research Institute in Boulder, Colorado, led a team that analyzed the seasonal water budget of an RSL site in Mars' huge Valles Marineris canyon system. The researchers' findings suggest that the site is recharged by an aquifer on Mars. In fact, Stillman's team determined that the total amount of water liberated from the area is equivalent to eight to 17 Olympic-sized swimming pools. The only way to annually recharge such a large volume of water is via an aquifer, Stillman said. 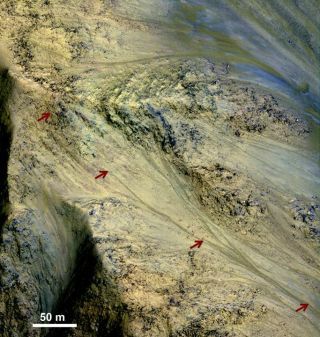 This work points to brine reaching the Martian surface via fractures that extend into a regional pressurized aquifer. Furthermore, the water lost from the myriad RSL within Valles Marineris — roughly 50 sites — is likely a significant regional source of atmospheric water vapor for much of each year, researchers said. Both the briny nature and water loss, due to vaporization, of these RSL suggest that there is a zone of salty regolith within a few centimeters of the surface at these sites, Stillman said. RSL "are truly fascinating features, and I think the best place to search for extant Martian life," Stillman told Space.com. Leonard David has been reporting on the space industry for more than five decades. He is former director of research for the National Commission on Space and is co-author of Buzz Aldrin's 2013 book, "Mission to Mars — My Vision for Space Exploration," published by National Geographic with a new updated paperback version to be released this May. Follow us @Spacedotcom, Facebook or Google+. Originally published on Space.com.